ChatBot Implementation | Accelirate Inc.
as well as the new Application Delivery mechanism. Customer Engagement today is all about maximizing and optimizing the potential of Digital and Physical Customer Service Channels and provide the Customers with a smooth experience. Customer Engagement broadly covers Customer Service and Customer Acquisition. Over past few decades, Companies have made huge investments in Customer Service Call Centers and recently have also strengthened their Self-Service Customer Engagement Portals. Although Self-Service portals are the holy grail for many Companies, the reality is that the Self-Service Digital layer on top of disparate internal and external systems is almost always an ongoing effort due to existing Technology debt and fast evolution of the Business. So as much as the Companies would like to automate most aspects of Customer Acquisition and Customer Service through these Self-Service portals, they still have to invest heavily in Call Centers. Until now, the Customers have had the option to Chat or talk to a Customer Service Representative if their questions or issues were not handled by the Self-Service portals. This Machine to Human transition sometimes is a frustrating experience for the Customer. This is where AI enabled Chatbots have a potential to take the Self-Service model to the next level. 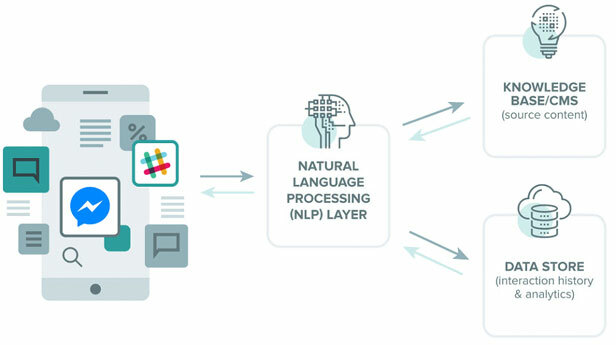 The Chatbots can be initially configured and setup to understand structured as well as unstructured Customer queries and provide them with appropriate answers without involving a human. For e.g. if a Customer is unable to interact with the Self-service portal for whatever reasons, they could ask their question to the Chatbot i.e. “What is my Credit Balance?” The Chatbot can be trained to handle multiple variations of such questions through pre-trained data. The Chatbot can then gather the relevant Customer information, query the back-end systems (which can be accomplished by using RPA Robots) and present the information to the Customer interactively. This entire workflow can be completed without human intervention thus reducing the Call Center costs considerably. However, the Chatbots must be properly trained to handle corner cases and handover to a human at the appropriate times otherwise a negative Customer experience can quickly erode any benefits from deploying such Technology. How Complex is an implementation of typical Chatbot? At a high level, Chatbots implementations can be categorized as low, medium and high complexity. A medium complexity Chatbot can be trained to answer more complicated questions as well as interact with backend systems to retrieve appropriate information. For e.g. the Bot can answer Credit Balance related questions. A high complexity Chatbot can be trained to answer more complicated questions as well as has built in workflows and application functionality within it. For e.g. an entire Credit Card or Mortgage Loan Application process can be handled by such a Bot.